I've been lurking for the past few months reading and ingesting all the great information here. I've run into one question that I can't seem to find answered. I've uploaded a plan of my basement remodel, but the file converter ate my resolution. Since I'm so new I can't post links, you can copy/paste the text below into your browser to see a full res version. Imgur is a free image hosting service that was made popular on Reddit. Anyway, I'm wanting to put a freestanding tub inside my shower. I really like the look, I understand that it may not be the most practical thing or least expensive thing to do. I have a few issues I need to solve before I get started. I'm still wrapping up my drawings so I haven't started work or pulled permits yet. I can't seem to find a solid answer to is how to properly drain the tub through the sheet membrane. I spoke with Eddie Brenzek from Schuluter and he suggested placing a second linear drain under the tub and letting the tub dump into it without solid connection to the drain line. I'm not fond of this idea. Plus those drains are stupid expensive, and I'm already buying one for the shower. I was thinking about using a Kerdi-Drain flange, setting it in my waterproof membrane like a typical open drain. Then only installing a portion of a Schluter Grate Kit (one of the ones where the flanges allows a screw in drain) then tiling. Upon setting the tub the tub MFR's pop up drain would screw into the Kerdi Grate Kit. The caveat here is that I'm just a dumb architect who is going to DIY most of this job. I have yet to get my hands on any of these parts to actually see if what I'm suggesting is possible. All that I know is that I want the tub water to be directly connected to the drain. And it seems to me that the proposed solution above is the on the correct train of thought to make this work. What you guys think? Installing a free standing tub on a shower deck with positive drainage. Am I asking for problems here? Tub weighs 385 lbs dry, and ~1200 lbs full. I would caulk/seal around the edges but I would set in in strips of silicone on the base to allow water to eventually pass underneath. Bad idea? I've seen a bunch of pictures of free standing tubs in showers with seemingly flat floors. Are they just done incorrectly? While water will occasionally get between the tub and the wall, it's not going to be an appreciable amount. Wall construction is all light gauge framing, no wood in my basement. I'm using kerdi-board for the shower surround. Any comments on proposed shower/tub layout with respect to Schluter products? I'm going for a curbless look, so I will be using their SR ramp up, then using a trimmed linear preformed base for the shower portion with dry extensions. I'm still deciding on whether to use built up kerdi board (assuming it can support the load of the tub) or do a kerdi sheet/dry pack mortar base for the tub deck. This product looks promising to thread the tub drain into the schluter drain flange... once again copy/paste into browser. The drawing you submitted is too low a resolution to get any detail. Where will the tub faucet controls be and how will they be ran? In a self standing tub normally they come up from the floor meaning you have a penetration not just for the drain but for your pressure side plumbing too. Most of the free standing tubs within a shower area I have seen it's a curbless shower and the tub is far enough away from the shower head that it really isn't part of the shower and not really within the wet area or pan area of the shower so you don't have to worry about water form a shower getting near the tub. If your shower is so small that the free standing tub is part of the wet area of the shower then I don't think you really have the space for the tub. My 2 cents anyway. *EDIT* Okay I see the link to your pic. From what I can tell you don't even have enough room in your proposed shower to fit a 30" diameter circle to fit without bumping into the tub which is the minimum code shower size. Or maybe you are right at the bare minimum (no dimensions so can't tell exactly just eyeballing off other dimensions). Either way, that will be one very narrow shower. IMHO you don't have room for the tub. That space will be far more enjoyable as a nice sized shower vs a VERY narrow (possibly below code narrow) shower with a tub in the way. It might also be considered a fall hazard because it is so narrow in that shower someone with shampoo in their eyes could easily bump knees into the tub and potentially fall. Also that tub will get pretty icky inside and out always being exposed to the shower stream and soap scum. More so then a shower tub combo since it never sees full shower spray to clean it but rather body bounce off residual. If the shower was big enough that the tub was basically outside the shower area I would say sure go for it but in this case I think you are trying to fit 2 pounds of you know what into a 1 pound bag. Last edited by ZZZK; 10-07-2016 at 04:01 PM. If space is a concern, perhaps putting the tub on a 45 in one corner would give more room for a shower area in the opposite corner? As for waterproofing, if you locate the drain of your bathtub near a wall, you could use a horizontal outlet tub waste and overflow and locate your trap and water supply lines in that wall. That way you wouldn't have to penetrate the floor waterproofing, but just the wall waterproofing. For the wall penetration you could use something like KERDI-SEAL, at least for the water supplies. BTW, I'm just brainstorming, I don't have any experience with your proposed configuration. Thanks for the comments ZZZK - I'm a commercial architect so I don't get to touch stuff like this. It's been a learning experience for sure. I'm gonna break down your post and reply in sections. Great point, I was kind of worried about that. I based my sizing on the the google image searches that I used for inspiration. I have flexibility to extend the length of the shower/tub area into the adjacent storage room. I currently have 33" from glass to tub rim. *EDIT* Okay I see the link to your pic. From what I can tell you don't even have enough room in your proposed shower to fit a 30" diameter circle to fit without bumping into the tub which is the minimum code shower size. Or maybe you are right at the bare minimum (no dimensions so can't tell exactly just eyeballing off other dimensions). Either way, that will be one very narrow shower. IMHO you don't have room for the tub. That space will be far more enjoyable as a nice sized shower vs a VERY narrow (possibly below code narrow) shower with a tub in the way. You can be the one to tell my wife that she can't have her tub So with a 33" x 72" shower footprint, what you think is the acceptable width to set a freestanding tub next to is? 48" x 72"? It might also be considered a fall hazard because it is so narrow in that shower someone with shampoo in their eyes could easily bump knees into the tub and potentially fall. Let's not contrive safety issues. Also that tub will get pretty icky inside and out always being exposed to the shower stream and soap scum. More so then a shower tub combo since it never sees full shower spray to clean it but rather body bounce off residual. Thanks for validating another concern of mine. I knew that this setup would maybe need a little more cleaning than usual. If the shower was big enough that the tub was basically outside the shower area I would say sure go for it but in this case I think you are trying to fit 2 pounds of you know what into a 1 pound bag. It's a 72"x72" footprint currently for the shower/tub area. See attached, for proposed layout... seems huge to me. Space is a concern, but not in the way you might think. I'm trying to balance an awesome 2nd bathroom with more living area for my family. This is the third major layout for the basement so for checks all the boxes. I'm stuck at 6' overall width to the bathroom, due to main supply and return ductwork immediately outside between the bathroom and pipe columns that are 6'-5" to b/duct. Not exactly code compliant. Bathroom can get longer, but not wider. I still need to leave space in the storage closet for wifey's clothes. That would be a great option, but we have settled on a specific tub. I hate to sound inflexible, but there is a specific look I am trying to achieve with this bathroom. I appreciate it! For all the images out there of these types of tubs/shower setups there is very little on the technical execution on how to do it properly. It can't be that hard. It's the Still tub by Hydrology. Real world execution of what my minds eye thinks of when I imagine a freestanding tub. Nothing really special in the form. But there are a lot of subtleties that other tubs miss. This one hits them all on the nose. I know it's a super architecty answer, but I'm not going to apologize for that. I see, that tub has no legs, has a skirt all around that goes to the floor, and has an integral overflow like a sink. The full skirt explains your issue #2, I couldn't understand the issue for a freestanding tub with legs. So the only way to do a horizontal outlet drain to avoid penetrating the floor waterproofing would be to build a raised platform on top of the floor waterproofing, maybe 4-6" high? Then a horizontal fixture drain could pass into the rear wall without penetrating the floor waterproofing. Your ideas for connecting that tub's drain outlet to a kerdi drain may require more vertical clearance below the tub's drain outlet than you have. Fundamentally, the only advantage of using the kerdi drain is to provide an easy way to flash the pipe penetration (the tub drain) through the floor waterproofing. A floor-worthy version of KERDI-SEAL or KERDI-KM would also work. Just have to read up on how to bond the membrane to it. Looks like I'll have to use some Noble products to do it. Did you add in the weight of two people in the tub? You may want to assume a total weight of 1,500 lbs. In any event, call the manufacturer of the tub and ask them what is the square inch measurement for the entire bearing surface on the bottom of the tub. 1,500 / (bearing surface) will give you a psi figure to compare to a tiled surface with a Schluter ramp. I'm guessing a properly installed mud base will have a psi rating much higher than the tubs bearing psi. One thing to watch for would be the thickness of the mud base at the thinnest part. There is a minimum thickness needed for the mud to be useful. Also, I watched the video showing how the tub is connected to the drain. The tub appears to magically flip over and fly gently onto the floor drain. If your tub weighs 385 lbs empty, you may want to do a dry run in a large carpeted area to determine exactly how many people you need to flip the tub and maneuver it safely and gently onto the floor drain. Do you have enough room between the tub and the wall for humans to stand while the tub is lowered? Big heavy things tend to tear up stuff as they are moved, especially a newly tiled floor and newly tiled wall. Great question and good points. I didn't not figure extra weight because of water displacement and we are mostly water anyway, but I calculated the full water capacity of the tub. That said I was actually looking into this yesterday after reading that drypack mortar can fail when it is too thin. From my calcs Schluter's Kerdi board either doesn't have the bearing capacity, or if it does, has zero safety factor built in. I found the above document from USG during my research and it says that their foam backer board has a really high comprehensive strength compared to Kerdi-board. The way I'm trimming the central linear drain pan I might have 3/4"-1" of difference in between the shower pan and the bare floor. I'm concerned that might be a little too thin for drypack put to have a proper bearing capacity. I just need to figure out if I can Kerdi-Band to it and what if any compatibility issues that there might be. Lol yes, if I only had telekinesis powers to make it look that easy. I'm having the tub delivered and taken downstairs and it's going to spend most of construction hanging out in the utility room directly across the bathroom. I'm going to work my way out of the bathroom in regards to setting fixtures so I'll have some free space to test out flipping it once I dolly it in there. I may also prop the tub over the drain with cribbing and slowly work my way down. I'm also considering setting up a block and tackle if it's too unwieldy. Probably overkill but ultimately probably the safest. Adapting Schluter linear drain to Durock Custom Shower Pan? What do you all think? Good idea or bad idea? They both seemingly very similar in terms of waterproofing method - fleece lined sheet membrane attached with unmodified thinset. 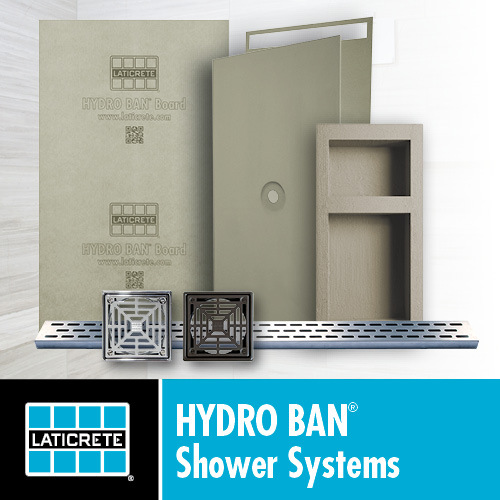 I'm askbecause I'm planning a curb free shower and am using plank size large format tile. I'd like to avoid the drainage facets needed for a point drain. All that really needs to be figured out is any height difference at the low points. If I provide a section of the pad to Durock they might be able to match the low point height of a Schulter tray since it's custom anyway. Otherwise I would need to do mud extensions to my Schluter tray and then apply Kerdi. I'm a DIYer but I'm already taking on a lot of new skills with my basement/bathroom renovation. George, it'll help if you'll keep all your project questions on one thread so folks can see what you're working on and what's been previously asked and answered. The only way you'll know if USG will make you a custom foam tray for your application is to ask them directly. I would still recommend you make a custom mud bed for your application. Far less expensive and far more compressive strength.